Prof. R. A. Greiner, aka Doc G.
See photos of her new display case! Take a look at his certificate. Rob Preston of Pittsburgh, PA, decided to create this traveling OMT (Occasional Mapugger of the Time) award for those who make a contribution to MAPUG beyond the occasional post. He is a highly skilled craftsman and quite a humorous guy as you will see from his photos of AstroBarbie and her LX200. I'm very proud to be award winner #1 and look forward to selecting the next person to enjoy the company of AstroBarbie and her wonderful 8" LX200. To tour the other photos, select from the hot spots in the banner graphic above. BTW, AstroBarbie is fitted with a belt for riding the fork arms in place of the optical tube assembly. Just opened up the OMT Award that Rob Preston constructed for my efforts in putting together the Mapug Topical Archive. It is so incredibly beautiful in its detail and accuracy that I spent over 15 minutes examining it and discovering new features that defy my construction skills. I will try to describe it here tonight and will take it to school tomorrow to make a digital photo to post for all to enjoy. First off, I decide to open the large envelope that came separately. As I grip the heavy card to pull it out of the envelope, I jump back as it starts talking to me! 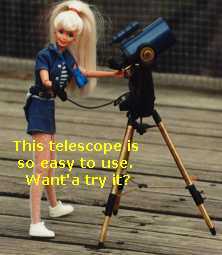 Astro Barbie wants to stay out all night observing and then spend the day at the mall. If I was a tall as she, I would have other plans for us than going to the mall. I now turn my attention to the package--it arrived in a hi-density plywood cube about 10" on a side with finger groove joints and a top that aligns itself to the main base unit. Great woodwork, but everything inside is hidden in protective wrap. There's Astro Barbie's blond hair sticking out. I extract her and note the 7x50 binos around her neck. Ok, let's get that LX200 out. Rolls and rolls of wrapping and WOW, there's the blue tube with black mirror cell and fork arm assembly. Unroll the next piece and there's a *fully* functional tripod. There's a little roll left--and it revels a 9x60 straight through finder! They all assemble just like the real thing. Believe that if I was to paste a picture of a real person beside a picture of this model, most would never notice it wasn't a full-size scope. *The finder has a front lens and I can actually look thru it (no magnification, but that's OK!). The ring mount installs into a bracket attached to the OTA. Each ring actually has 3 functional collimation screws! The dew cap is even larger that the main finder body. *The OTA has a front corrector lens held in place by six screws in a retaining ring. The secondary holder has 3 collimation screws and there's actually a secondary mirror (probably just a reflective piece of metal or glass). The primary mirror has a central shaft that the real one slides on and baffles the incoming light cone. The OTA attaches to the fork arm bearings with separate molded plates w/2 attaching screws--just like the real one. *The focuser knob has knurling on the last third. *There's a handle with the proper bends in it attached to the mirror cell under the diagonal. *The OTA moves in RA and Dec w/lock knob on right fork arm. The Dec has the manual adjustment knob w/knurling too. *Fork arms have the carry handles. *The Dec power cord and control paddle cord are spiral wound. *Base attaches to the tripod head with a threaded rod from an amazingly real spreader assembly--even the reinforcing rib on the bottom side of the spreader arms is thicker in the center tapering to nothing as they reach the ends where the spreader arms bear against the legs. Of course, there are eyepiece storage holes in it. The spreader tightening knob is a 9-pt. star w/acorn nut on the end. *The tripod legs can be extended with telescoping interior sections w/rubber tips. There's two locking thumb screws w/caution not to over tighten or there will be damage--just like Meade warns us! The spread limiting rods at the bottom of the legs connect with a central unit that allows each rod to pivot freely like the real one. Guess that's enough in words. Hope the photo gives justice to this work of art. Well, my enthusiasm is certainly increased by this. Going to be tough to give up in a few months! Can't tell you how honored I am by this Rob--Thank you! You are one hell of a craftsman!